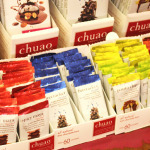 Chuao Chocolatier, based in Encinitas, creates delectable and unique flavors, such as Potato Chip and Maple Bacon. This treat is great for men, women and children. Kim Yubeta makes stunning women’s jewelry using stones and sterling silver. 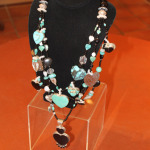 The necklace pictured even has a lovely heart motif. 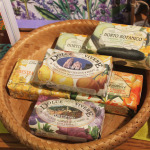 Aromatic soaps, lotions and sprays in soothing scents like lavender. Cozy socks by K. BELL in holiday patterns like kisses or hearts are great to cuddle up with. 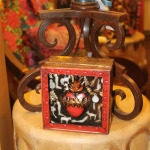 In addition to great gift ideas, Bazaar del Mundo has heart-themed home décor to help add pizazz to your Valentine’s Day party. 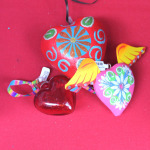 Heart-shaped pillows, wall art, books, retablos and other folk art are available. 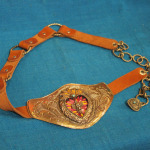 To see more Valentine’s Day-themed gift and décor ideas, visit our Facebook page. 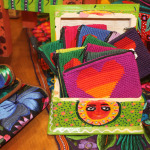 For more chic Valentine’s Day gifts and hidden gems from all around the globe, visit Bazaar del Mundo Shops at the north entrance to Old Town on the corner of Juan and Taylor.